"....at the end of the day, your wedding should mean something to you, because your guests will feel that and that’s what they will take home. You’ve been a wedding guest yourself, right? And how does it feel to attend the same thing over and over again? Our wedding was not perfect, but some of our guests that we bumped into after it will really say, they were blessed with our wedding or that it was really memorable." I have heard so many times how some brides have considered having a barn wedding but would say, "wala namang barn sa Pinas!". So ladies, tell me, why would this belief stop you from working with what we have instead? Beverly: I really like arts and crafts, DIY projects and I loved the weddings that I see in blogs abroad like greenweddingshoes or ruffledblog, etc. And, I am so not good in wearing heels, so I really did not want a wedding that will make me wear heels. Alan, on the other hand, likes photography, he’s very into nature—he’s a mountaineer, a licensed diver and he loves animals and organic farming. When you ask him, he’s the type who wishes he can have an orangutan for a pet and be a farmer or a carpenter of some sort. Alan and I really wanted a laid back outdoor wedding from the start. That kind of wedding fits our personalities best, plus we met in a missions-training school, so we wanted something that can be related to a harvest theme. We knew what we wanted… simple, relaxed, fun, outdoor wedding that is practical and that will glorify the Lord, and we thought that a farm wedding will be perfect. 5. 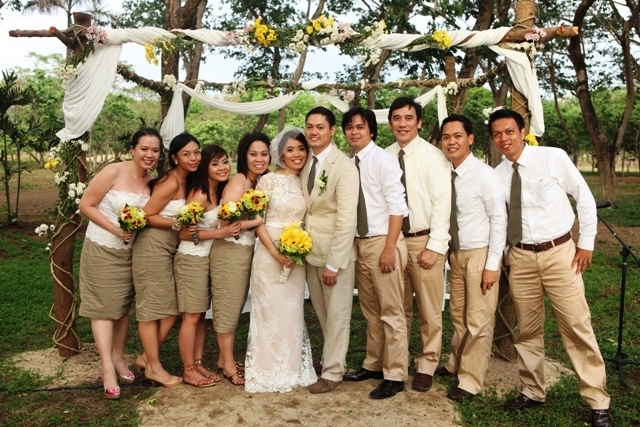 Entourage- I wanted to simplify our entourage, we had 5 pairs of Ninongs and Ninangs, but only 3 people can attend because they were mostly missionaries, or they were out of the country. 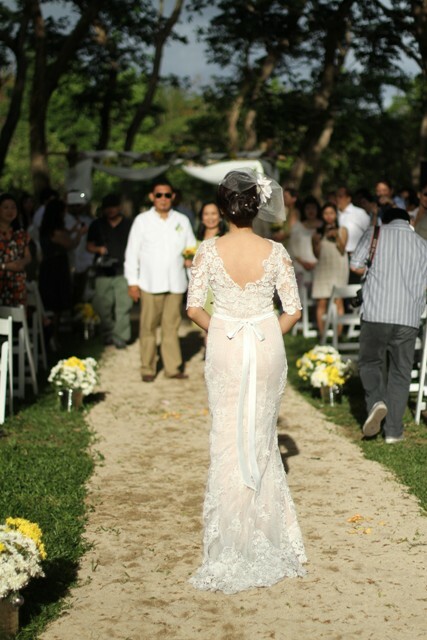 We did not ask for proxies, so we had 1 pair and a ninong without a pair walk down the aisle. That ninong was happy by the way, that he did not have to small talk someone he doesn’t know. We did not have groomsmen and bridesmaids, too! RB: Since there were a lot of "non-traditional" aspects of your wedding, what were the challenges that you had to face while planning and how did you overcome it? Beverly: We were very thankful that our families did not meddle much during the planning. But it was quite difficult to explain our concept in the beginning. 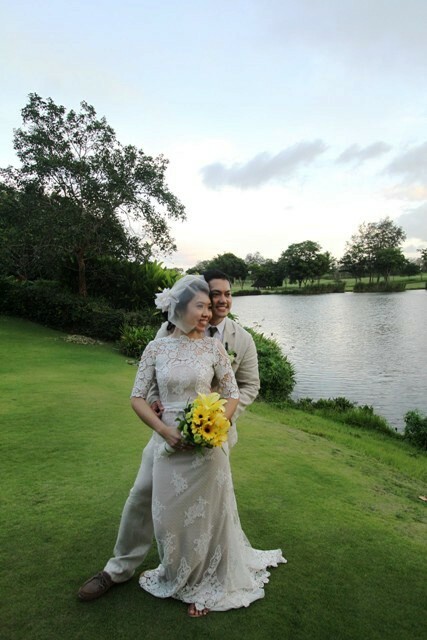 I remember, doing our first ocular, my mom totally didn’t get the idea and bugged me that she can ask a friend to sponsor us in a golf club for the wedding (maybe she found the venue too outdoor and rustic). 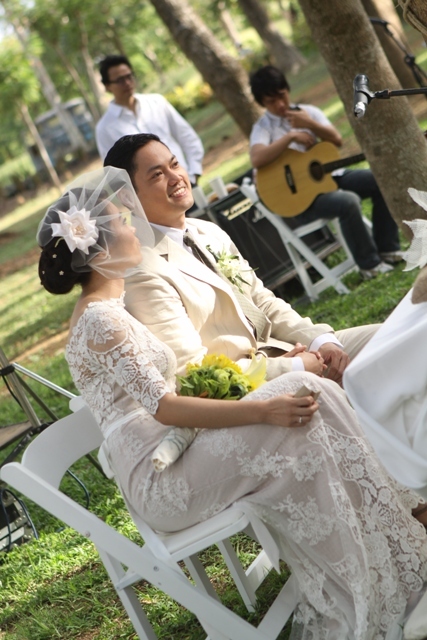 Some people kept on pertaining to it as a garden wedding, just because it was outdoors. To help us explain, we did a wedding website and placed the address in our invitation, details such as mood, feel, what they can do (since out of town) were all there, even pegs for what they can wear. Another big challenge was the food. We really did not want a buffet set-up because we did not want guests to be lining up and oftentimes when the last table gets to eat, they are extremely hungry and the first tables are already leaving discreetly because they have long been finished. So we wanted an informal sit down dinner. Guests will be served course by course but not so formal. So the catering was really a challenge because there’s no kitchen in the farm. Our caterer set up a kitchen and especially created a menu for us based on our theme and our favorites, not to mention, she had to consider what is weather-appropriate to avoid spoilage. RB: What makes you a "rebellious bride" ? Beverly: I wanted to be with Alan already, so why prolong just for the sake of preparing diba? I’ve done so many weddings before (coordination, etc), and no matter how long a couple prepares, there’s still work to be done a week prior to the event or the night before the wedding, and as they say, you’ll never save enough money anyway… marriage is a leap of faith. Beverly: Some would say, weddings are once-in-a-lifetime, so others really spend their savings on their big day. Ako, kuripot as I was, I made sure we were very practical in our spending. Beverly's approach to her wedding styling was very simple but it worked. In fact, it's even better than the "usual" been-there-done-that weddings! I told our stylist not to spend so much with flowers, I feel guilty that we will just be throwing that away. 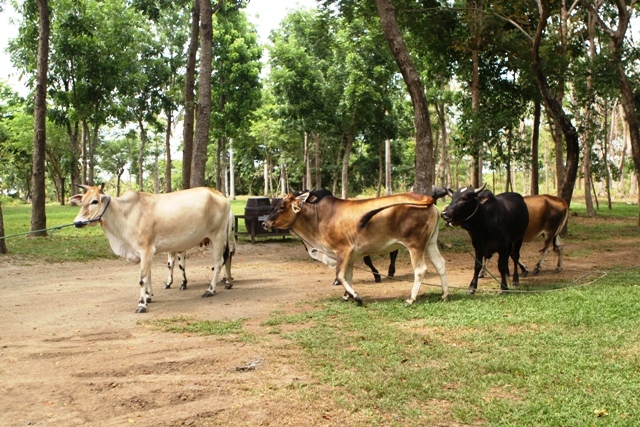 Though I know it’s a crucial part of styling, I did’nt care… nasa farm naman sila eh, so enjoy the woods, the plants and the animals. A lot of our wedding details were also DIY, and upcycled. I wore an old sandals, and we did not get the traditional stuff like souvenirs or photobooth. 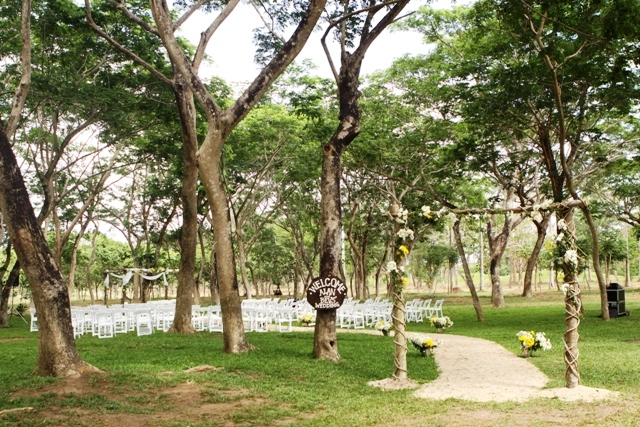 Beverly let her venue guide her--why over-style the venue when nature is so much more beautiful and organic? 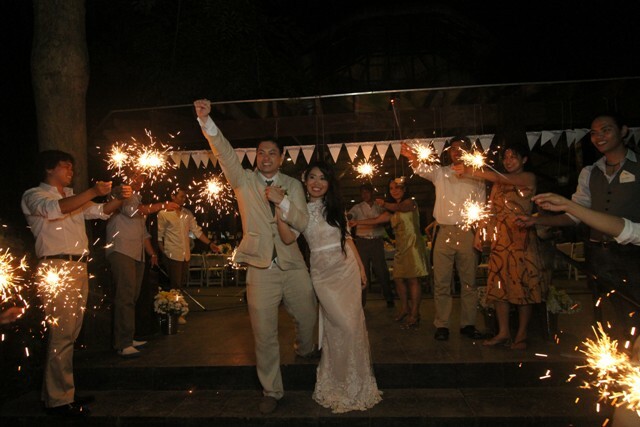 Beverly did not have the usual reception elements--but they had sparklers instead! How fun! Beverly: I did not have a plan B. Don’t get me wrong here, I know I sound so disorganized already, haha. I coordinate events and weddings, and my job in brand management really requires me to be a detailed person. But for my wedding, just for my wedding, I did not have a plan B. When people asked, what if it rains? My answer was… no, it will not rain. I just know it in my heart, because that was first in our prayer list. She chose suppliers not based on the "name"
Beverly: Finally, most of my suppliers were not very popular wedding suppliers. Most of them are friends and that I have worked with. After all, it’s a personal event for us. RB: Any shout-outs to the awesome people/suppliers who made your creative wedding possible? RB: What can you advice to brides who may be having second thoughts about planning a "creative" wedding? Beverly: “Its definitely worth it!” At the end of the day, your wedding should mean something to you, because your guests will feel that and that’s what they will take home. You’ve been a wedding guest yourself, right? And how does it feel to attend the same thing over and over again? 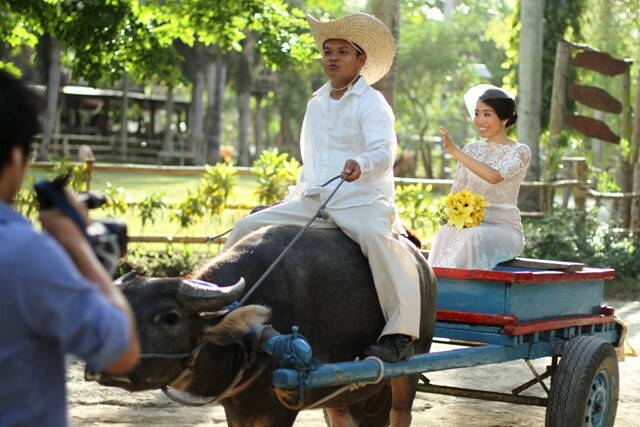 Our wedding was not perfect, but some of our guests that we bumped into after it will really say, they were blessed with our wedding or that it was really memorable. Thanks so much for featuring our wedding! oh my, what a great idea for a wedding! it looks super fun and comfy..great ideas! !